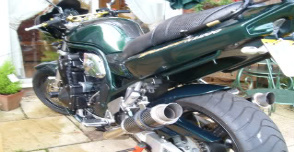 hello world, have just bought my 1st Bandit, a 98 reg 1200n in green, gold wheels, low miler of 15.4k, and I am loving it, it's crazy fast! need to make it mine though, it.s jacked up and I'm not keen on that just yet, so gonna drop it at least until I'm used to her handling quirks. It's pretty standard apart from Yoshi can, so I'd appreciate advice on twin headlights for instance, caio for now, oh btw way I'm kin the far north Scotland with the mental A9 as my main road fro A-B.